A tradition in our household when my husband and I were first married, was to head over to my mother-in-law’s house for Sunday breakfast. When we arrived, the smell of freshly brewed coffee filled the air. Gramma Curley would have on her apron as she filled plates with piles of pancakes, pastries, scrambled eggs and various meats. On one occasion, she poured a reddish meat and potatoes mixture from a small pot onto a plate and my husband’s eyes lit up. I asked what it was and he replied, “It’s corned beef hash”. Well, I had never seen anything like it before. Coming from an Irish family, you would think that I would have known what corned beef hash was. After tasting it, I knew that I had to come up with a recipe of my own. This stuff just wasn’t happening for me. 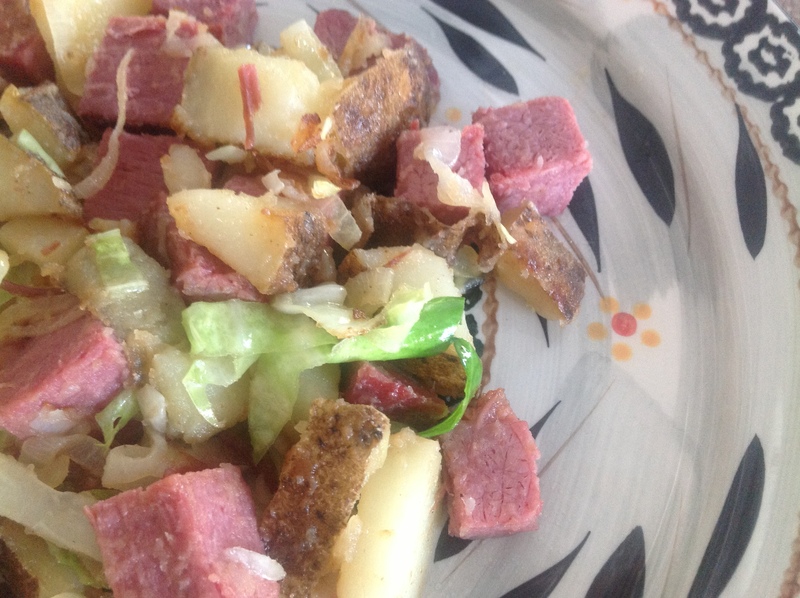 Here is a little something I put together one night with left over corned beef, some shredded cabbage, onions and a few baked potatoes. Give this recipe a try…you won’t be disappointed. Pre-heat a medium skillet on the stove top , add canola oil and saute potatoes until golden brown. Add shedded cabbage and onions. Season with garlic and onion powder; saute until slightly soft. Add cooked corned beef and continue to saute until heated through; about 15 more minutes. Serve it up hot with some Irish Soda Bread. This is a great one pot meal.